On the edge of the Moroccan capital of Rabat stands the walled city of Chellah. One of the first signs of human occupation in Morocco, it was started by the Phoenicians in the 3rd Century BC. and developed further by the Romans around 40AD. They changed its name to Sala Colonia. 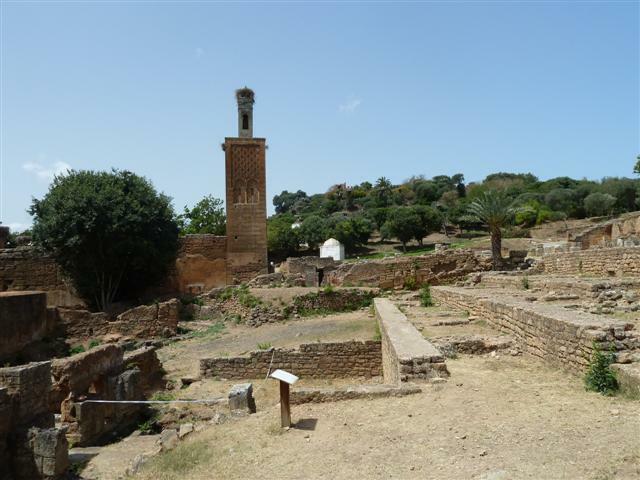 Although Chellah is now two kms inland, dominating the fertile plain of the Bou Regreg River, it was originally on the Adriatic coast. Sala or similar names usually had something to do with salt. Medieval Moorish additions were built from the 12th Century, including the surrounding walls and the lovely Oriental gateway. It was finally abandoned during the 16th Century. In 1755 there was a terrible earthquake in Lisbon that caused devastation in many other countries, and Chellah was badly damaged. Now the site is occupied again, by the wildlife. Storks perch in their wobbly nests on top of the high buildings, clacking their beaks together. The noise echoes around the ruins. They pause to peer down at us, then the clacking starts again. An old lady walks briskly along the path, calling ‘Mimimimimi!’ in a high voice. Suddenly, cats of every shape, size and colour appear from all directions, dashing towards her. She tips out food for them, smacking one forceful feline on the bottom and telling it off. Two tiny kittens hold back nervously, then hunger takes over and they sidle shyly towards the group and join in the feast. At the end of the path is the ancient Moors’ bath. A man sells smelly boiled eggs which ladies who can’t conceive peel and throw in the water. If the eels eat it, the women are supposed to become fertile. The eels and eggs’ fertility symbolism is pretty obvious. 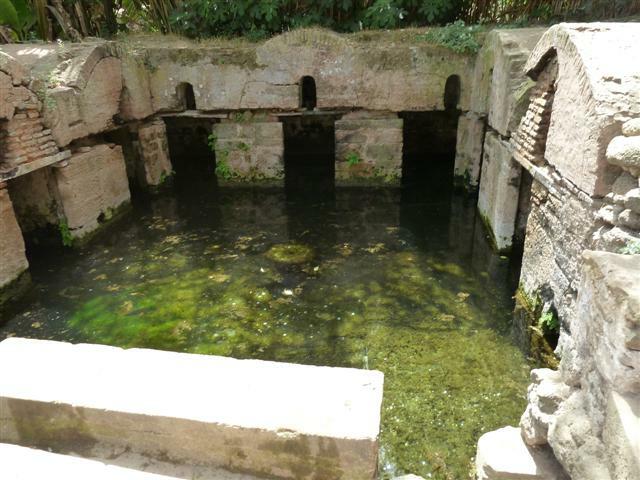 Further on are the Roman baths and drainage system, and a Moorish fountain. We stepped on the original mosaic floors, which worried me a bit. Everywhere, vivid blooming shrubs and plants grow amongst the ancient ruins. The whole site had a feeling of peace in the hot Moroccan sunshine, with flowers, fish, fur and feathered friends all thriving in perfect equilibrium and harmony. Even with the noticeable signs of the terrible earthquake it’s still a magnificent, impressive site. And the views over the walls are spectacular. Why you should visit Johannesburg, South Africa. Malta Diary ~ the nerve-control centre of the lost continent Atlantis? This piece has revived wonderful memories of my visit to Chellah two years ago. It is a magical place – exactly as described by Lyn. But then Morocco I found to be a very magical country in general and during the many weeks I spent there I enjoyed every minute of every day and the Moroccan people are most sociable.